Many of these can be used as compounds e.g. intil, inower, ootower (outside), in o, aff o, naraboots etc. Note the related hereawa (hereabouts), therrawa (thereabouts), yonderaboots (there or thereabouts). Otherwise use is broadly similar to English although there are some variations especially related to nouns e.g. think on (think about), merrit on/wi (married to), beelin at (angry with), ower the windae (out of the window), in a praisent (as a present), wyte on (wait for), cry on (call to), feart for (afraid of), mind o (remember), lippen tae (depend on), speir at (ask, request), get oot the road (out of the way), ask for (enquire after someone’s health), lauch on (laugh at). Needs and wants don’t take tae but use a past participle instead. Thon hoose needs pentin (That house requires to be painted). Prepositions are idiosyncratic and illogical in most language and therefore quite difficult to learn. The best way is to ‘collect’ examples. 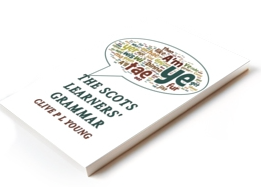 This highly idiomatic use of prepositions to greatly extend the meaning of verbs, although of course a feature of standard and colloquial English, is very common in Scots and to some extent belies the claim that Scots has a restricted vocabulary.